Grace Glass proudly introduces an innovative design that will shake you up! Double Chamber is intended exclusively for oil lovers. Made of a high quality borosilicate glass, it features two chambers on different levels that extra filter your smoke before it reaches your mouth. A bending neck on top offers you a comfortable grip. 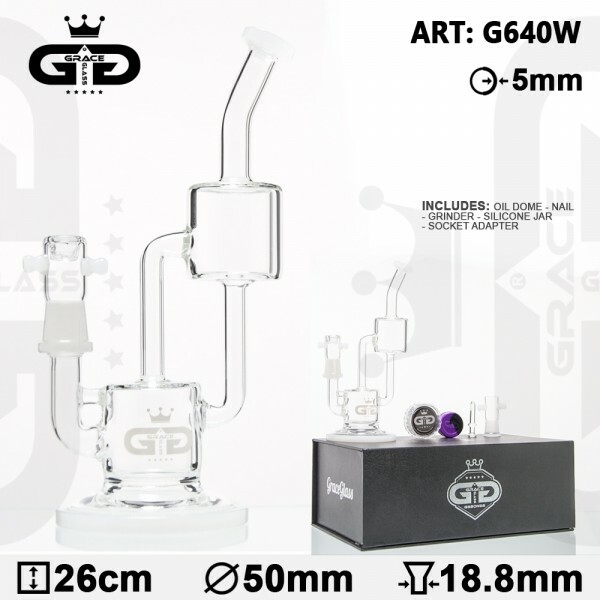 With the white Grace Glass logo featuring at the front of the bottom chamber, the whole set-up is delivered inside a box, including a 2 point oil dome, a nail, a grinder, a silicone jar, screens.